Qualcomm will release a Snapdragon 850 chipset: a beefed-up version of the Snapdragon 845. Unlike the 845, the 850 will primarily run laptops, tablets, and hybrid PC devices. Reportedly, both Microsoft and Dell are working on foldable mobile devices running the newest chipset. Windows Phone is dead, but that doesn’t mean you’ll never see the Windows operating system on a mobile device again. According to information on WinFuture, both Microsoft and Dell have plans to release a foldable smartphone/laptop hybrid running on the upcoming Qualcomm Snapdragon 850 chipset. Of course, the latest-and-greatest mobile chipset is the Snapdragon 845, which powers flagship devices like the Samsung Galaxy S9, the OnePlus 6, and the HTC U12 Plus. The Snapdragon 850 is reportedly just a Snapdragon 845 chip that’s been beefed up a bit to run at faster speeds. 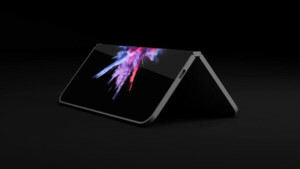 Along with this mysterious Microsoft device, Dell is working on a project codenamed “Januss” that will allegedly be similar in that it will be a foldable mobile device running the Windows 10 operating system. Whether or not we see these hypothetical devices any time soon (or ever), we undoubtedly will see devices running the Snapdragon 850 chipset before the end of 2018. Asus, Dell, and Lenovo (among others), all have traditional laptop/tablet hybrid devices in the works running on Qualcomm’s newest chip. According to WinFuture, Qualcomm’s intention is to continue to push the Snapdragon 845 for traditional smartphone products, while simultaneously pushing the Snapdragon 850 for use in ARM-based PC’s. Since the 845 and 850 chipsets are essentially the same product, just tweaked a bit, we can expect more devices in the future that blur the lines between laptop, tablet, and smartphone. What do you think? Is a laptop/smartphone hybrid device as depicted in the renders above interest you? Let us know in the comments!